TOPIC: “Foraging in 5 Minutes: A Step-by-Step Guide to Enriching our Parrot’s Lives, On Time, and On Budget” – This newest workshop seeks to help parrot owners give their parrots the opportunity to engage in the most basic of natural behaviours – foraging. Parrots spend most of their time in the wild looking for and preparing their food. In our homes, filling up at the food dish not only predisposes our parrots to obesity, but creates activity deficits that can lead to a host of behavioural problems, including feather picking, screaming, aggression, and excessive hormonal behaviours. Owners learn to bring out the “Wild” in their parrot safely, without breaking the bank, or building a toy construction assembly line in their basement. It’s ironic that a position in the career of acting, and a summer application for the theaters at Canada’s Wonderland, lead to Kristi’s interest in working with animals. Hired as an usher in the theaters, Kristi had the opportunity to work in the Dolphins/Sea Lion facility, and was lucky enough to eventually work backstage, cutting fish, helping in training sessions, and looking after the animals in the evening. After 5 summers, Kristi moved on to work full time as the Small Animal/Bird Department Manager at P.J.’s Pet Centers, Yorkdale Mall. While there, Kristi had the opportunity to work with dozens of species and to study their behavior. 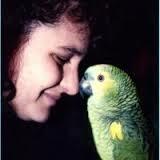 Of particular interest was her work in raising and socializing baby parrots. For the last 15 years, Kristi has been thrilled to lend and hone her skills as head technician and behavior consultant to the Animal Hospital of High Park. Recently, Kristi has embarked on spear-heading the launch of the newest full-service exotics clinic in the Greater Toronto Area, Glen Erin Animal Hospital. Kristi is a professional member of the IAATE (International Association of Avian Trainers and Educators) and is a regular contributor to “Parrot Life Magazine”. Kristi is very active in the Ontario parrot community, and has lectured across the country, including guest appearances at the Canadian Parrot Conference, the Ontario Association of Veterinary Technicians Annual Conference, and the Ontario Veterinary College, just to name a few. In her spare time Kristi studies the behaviour of parrots, primates, elephants and marine mammals. She also sings (non stop according to co-workers), plays guitar, draws, gardens, and is owned by her Blue Fronted Amazon Parrot “Wilbur”, and a cat appropriately named “Squishy”.